This is “Delivering a Speech”, chapter 10 from the book A Primer on Communication Studies (v. 1.0). For details on it (including licensing), click here. Think of a speech or presentation you have seen that was poorly delivered. How did that affect your view of the speaker and his or her topic? Is a poorly delivered speech more bearable if the information is solid and organized? In most cases, bad delivery distracts us so much from a message that we don’t even evaluate or absorb the information being presented. In short, a well-researched and well-prepared speech is not much without effective delivery. This chapter covers important information about managing public speaking anxiety, choosing the appropriate delivery method, practicing your speech, and employing effective vocal and physical delivery to enhance speaker credibility. Discuss common sources of public speaking anxiety. Identify strategies for addressing public speaking anxiety. Employ strategies for addressing public speaking anxiety. If you feel fear, anxiety, or discomfort when confronted with the task of speaking in front of an audience, you are not alone. National polls consistently show that public speaking is among Americans’ top fears.Graham D. Bodie, “A Racing Heart, Rattling Knees, and Ruminative Thoughts: Defining, Explaining, and Treating Public Speaking Anxiety,” Communication Education 59, no. 1 (2010): 70. Yet, since we all have to engage in some form of public speaking, this is a fear that many people must face regularly. Effectively managing speaking anxiety has many positive effects on your speech. One major area that can improve with less anxiety is delivery. Although speaking anxiety is natural and normal, it can interfere with verbal and nonverbal delivery, which makes a speech less effective. In this chapter, we will explore causes of speaking anxiety, ways to address it, and best practices of vocal and physical delivery. Aside from the self-reported data in national surveys that rank the fear of public speaking high for Americans, decades of research conducted by communication scholars shows that communication apprehension is common among college students.Jennifer S. Priem and Denise Haunani Solomon, “Comforting Apprehensive Communicators: The Effects of Reappraisal and Distraction on Cortisol Levels among Students in a Public Speaking Class,” Communication Quarterly 57, no. 3 (2009): 260. Communication apprehension (CA)Fear or anxiety experienced by a person due to real or perceived communication with another person or persons. is fear or anxiety experienced by a person due to real or perceived communication with another person or persons. CA is a more general term that includes multiple forms of communication, not just public speaking. CA can be further broken down into two categories. Trait CAA general tendency to experience anxiety related to communication. refers to a general tendency to experience anxiety related to communication, in essence incorporating it into a person’s personality. State CAAnxiety related to communication that occurs in a particular situation and time. refers to anxiety related to communication that occurs in a particular situation and time.Graham D. Bodie, “A Racing Heart, Rattling Knees, and Ruminative Thoughts: Defining, Explaining, and Treating Public Speaking Anxiety,” Communication Education 59, no. 1 (2010): 72. Of college students, 15 to 20 percent experience high trait CA, meaning they are generally anxious about communication. Seventy percent of college students experience some trait CA, which means that addressing communication anxiety in a class like the one you’re taking now stands to benefit the majority of students.Jennifer S. Priem and Denise Haunani Solomon, “Comforting Apprehensive Communicators: The Effects of Reappraisal and Distraction on Cortisol Levels among Students in a Public Speaking Class,” Communication Quarterly 57, no. 3 (2009): 260–61. Whether CA is a personal trait or not, we all occasionally experience state CA. Think about the jitters you get before a first date, a job interview, or the first day of school. The novelty or uncertainty of some situations is a common trigger for communication anxiety, and public speaking is a situation that is novel and uncertain for many. Public speaking anxietyA type of communication apprehension that occurs in people when faced with giving a real or imagined presentation. is a type of CA that produces physiological, cognitive, and behavioral reactions in people when faced with a real or imagined presentation.Graham D. Bodie, “A Racing Heart, Rattling Knees, and Ruminative Thoughts: Defining, Explaining, and Treating Public Speaking Anxiety,” Communication Education 59, no. 1 (2010): 71. Physiological responses to public speaking anxiety include increased heart rate, flushing of the skin or face, and sweaty palms, among other things. These reactions are the result of natural chemical processes in the human body. The fight or flight instinct helped early humans survive threatening situations. When faced with a ferocious saber-toothed tiger, for example, the body released adrenaline, cortisol, and other hormones that increased heart rate and blood pressure to get more energy to the brain, organs, and muscles in order to respond to the threat. We can be thankful for this evolutionary advantage, but our physiology hasn’t caught up with our new ways of life. Our body doesn’t distinguish between the causes of stressful situations, so facing down an audience releases the same hormones as facing down a wild beast. The root of public speaking anxiety is the fight or flight instinct that is triggered when we face a fear. While we can’t completely eliminate anxiety, we can change how we cognitively process it. Cognitive reactions to public speaking anxiety often include intrusive thoughts that can increase anxiety: “People are judging me,” “I’m not going to do well,” and “I’m going to forget what to say.” These thoughts are reactions to the physiological changes in the body but also bring in the social/public aspect of public speaking in which speakers fear being negatively judged or evaluated because of their anxiety. The physiological and cognitive responses to anxiety lead to behavioral changes. All these thoughts may lead someone to stop their speech and return to their seat or leave the classroom. Anticipating these reactions can also lead to avoidance behavior where people intentionally avoid situations where they will have to speak in public. While we can’t stop the innate physiological reactions related to anxiety from occurring, we do have some control over how we cognitively process them and the behaviors that result. Research on public speaking anxiety has focused on three key ways to address this common issue: systematic desensitization, cognitive restructuring, and skills training.Graham D. Bodie, “A Racing Heart, Rattling Knees, and Ruminative Thoughts: Defining, Explaining, and Treating Public Speaking Anxiety,” Communication Education 59, no. 1 (2010): 70–105. In addition, it is important to address the physical manifestations of speaking anxiety. Although systematic desensitizationStrategy for managing public speaking anxiety that involves repeated real or imagined exposure to public speaking to reduce uncertainty and novelty. may sound like something that would be done to you while strapped down in the basement of a scary hospital, it actually refers to the fact that we become less anxious about something when we are exposed to it more often.Graham D. Bodie, “A Racing Heart, Rattling Knees, and Ruminative Thoughts: Defining, Explaining, and Treating Public Speaking Anxiety,” Communication Education 59, no. 1 (2010): 87. As was mentioned earlier, the novelty and uncertainty of public speaking is a source for many people’s anxiety. So becoming more familiar with public speaking by doing it more often can logically reduce the novelty and uncertainty of it. Systematic desensitization can result from imagined or real exposure to anxiety-inducing scenarios. In some cases, an instructor leads a person through a series of relaxation techniques. Once relaxed, the person is asked to imagine a series of scenarios including speech preparation and speech delivery. This is something you could also try to do on your own before giving a speech. Imagine yourself going through the process of preparing and practicing a speech, then delivering the speech, then returning to your seat, which concludes the scenario. Aside from this imagined exposure to speaking situations, taking a communication course like this one is a great way to directly engage in systematic desensitization. Almost all my students report that they have less speaking anxiety at the end of a semester than when they started, which is at least partially due to the fact they were forced to engage with speaking more than they would have done if they weren’t taking the class. Cognitive restructuringStrategy for managing public speaking anxiety that involves changing negative thought patterns about public speaking. entails changing the way we think about something. A first step in restructuring how we deal with public speaking anxiety is to cognitively process through our fears to realize that many of the thoughts associated with public speaking anxiety are irrational.Mike Allen, John E. Hunter, and William A. Donohue, “Meta-analysis of Self-Report Data on the Effectiveness of Public Speaking Anxiety Treatment Techniques,” Communication Education 38, no. 1 (2009): 54–76. For example, people report a fear of public speaking over a fear of snakes, heights, financial ruin, or even death. It’s irrational to think that the consequences of giving a speech in public are more dire than getting bit by a rattlesnake, falling off a building, or dying. People also fear being embarrassed because they mess up or are evaluated negatively. Well, you can’t literally die from embarrassment, and in reality, audiences are very forgiving and overlook or don’t even notice many errors that we, as speakers, may dwell on. Once we realize that the potential negative consequences of giving a speech are not as dire as we think they are, we can move on to other cognitive restructuring strategies. Communication-orientation modification therapyA cognitive restructuring strategy also known as COM therapy that addresses public speaking anxiety by viewing public speaking as a conversation rather than a performance. (COM therapy) is a type of cognitive restructuring that encourages people to think of public speaking as a conversation rather than a performance.Michael T. Motley, “COM Therapy,” in Avoiding Communication: Shyness, Reticence, and Communication Apprehension, eds. John A. Daly, James C. McCroskey, Joe Ayres, Tim Hopf, and Debbie M. Ayers Sonandre (Cresskill, NJ: Hampton Press, 2009), 379–400. Many people have a performance-based view of public speaking. This can easily be seen in the language that some students use to discuss public speaking. They say that they “rehearse” their speech, deal with “stage fright,” then “perform” their speech on a “stage.” I like to remind my students that there is no stage at the front of our classroom; it is a normal floor. To get away from a performance orientation, we can reword the previous statements to say that they “practice” their speech, deal with “public speaking anxiety,” then “deliver” their speech from the front of the room. Viewing public speaking as a conversation also helps with confidence. After all, you obviously have some conversation skills, or you wouldn’t have made it to college. We engage in conversations every day. We don’t have to write everything we’re going to say out on a note card, we don’t usually get nervous or anxious in regular conversations, and we’re usually successful when we try. Even though we don’t engage in public speaking as much, we speak to others in public all the time. Thinking of public speaking as a type of conversation helps you realize that you already have accumulated experiences and skills that you can draw from, so you aren’t starting from scratch. Thinking of public speaking as a conversation with an audience rather than a performance for an audience can help reduce speaking anxiety. Last, positive visualizationA cognitive restructuring strategy that addresses public speaking anxiety by visualizing success as a speaker rather than focusing on negative thoughts. is another way to engage in cognitive restructuring. Speaking anxiety often leads people to view public speaking negatively. They are more likely to judge a speech they gave negatively, even if it was good. They’re also likely to set up negative self-fulfilling prophecies that will hinder their performance in future speeches. To effectively use positive visualization, it’s best to engage first in some relaxation exercises such as deep breathing or stretching, which we will discuss more later, and then play through vivid images in your mind of giving a successful speech. This should be done a few times before giving the actual speech. Students sometimes question the power of positive visualization, thinking that it sounds corny. Ask an Olympic diver what his or her coach says to do before jumping off the diving board and the answer will probably be “Coach says to image completing a perfect 10 dive.” Likewise a Marine sharpshooter would likely say his commanding officer says to imagine hitting the target before pulling the trigger. In both instances, positive visualization is being used in high-stakes situations. If it’s good enough for Olympic athletes and snipers, it’s good enough for public speakers. Skills trainingStrategy for managing public speaking anxiety that focuses on learning skills that will improve specific speaking behaviors. is a strategy for managing public speaking anxiety that focuses on learning skills that will improve specific speaking behaviors. These skills may relate to any part of the speech-making process, including topic selection, research and organization, delivery, and self-evaluation. Skills training, like systematic desensitization, makes the public speaking process more familiar for a speaker, which lessens uncertainty. In addition, targeting specific areas and then improving on them builds more confidence, which can in turn lead to more improvement. Feedback is important to initiate and maintain this positive cycle of improvement. You can use the constructive criticism that you get from your instructor and peers in this class to target specific areas of improvement. Self-evaluation is also an important part of skills training. Make sure to evaluate yourself within the context of your assignment or job and the expectations for the speech. Don’t get sidetracked by a small delivery error if the expectations for content far outweigh the expectations for delivery. Combine your self-evaluation with the feedback from your instructor, boss, and/or peers to set specific and measurable goals and then assess whether or not you meet them in subsequent speeches. Once you achieve a goal, mark it off your list and use it as a confidence booster. If you don’t achieve a goal, figure out why and adjust your strategies to try to meet it in the future. Suggestions for managing speaking anxiety typically address its cognitive and behavioral components, while the physical components are left unattended. As we learned earlier, we can’t block these natural and instinctual responses. We can, however, engage in physical relaxation exercisesStrategy for managing public speaking anxiety that uses breathing and stretching to address the physiological responses to anxiety. to counteract the general physical signs of anxiety caused by cortisol and adrenaline release, which include increased heart rate, trembling, flushing, high blood pressure, and speech disfluency. I liken confronting the physical aspects of public speaking anxiety to chemical warfare. Some breathing and stretching exercises release endorphins, which are your body’s natural antidote to stress hormones. Deep breathing is a proven way to release endorphins. It also provides a general sense of relaxation and can be done discretely, even while waiting to speak. In order to get the benefits of deep breathing, you must breathe into your diaphragm. The diaphragm is the muscle below your lungs that helps you breathe and stand up straight, which makes it a good muscle for a speaker to exercise. To start, breathe in slowly through your nose, filling the bottom parts of your lungs up with air. While doing this, your belly should pooch out. Hold the breath for three to five full seconds and then let it out slowly through your mouth. After doing this only a few times, many students report that they can actually feel a flooding of endorphins, which creates a brief “light-headed” feeling. I lead my class in breathing exercises before the first few days of speeches. Once you have practiced and are comfortable with the technique, you can do this before you start your speech, and no one sitting around you will even notice. You might also want to try this technique during other stressful situations. Deep breathing before dealing with an angry customer or loved one, or before taking a test, can help you relax and focus. Discretely stretching your wrists and calf muscles is a good way to relieve anxiety and get your energy flowing while waiting to speak. Stretching is another way to quickly and effectively release endorphins. Very old exercise traditions like yoga, tai chi, and Pilates teach the idea that stretching is a key component of having a healthy mind and spirit. Exercise in general is a good stress reliever, but many of us don’t have the time or willpower to do it. We can, however, all take time to do some stretching. Obviously, it would be distracting for the surrounding audience if a speaker broke into some planking or Pilates just before his or her speech. Simple and discrete stretches can help get the body’s energy moving around, which can make a speaker feel more balanced and relaxed. Our blood and our energy/stress have a tendency to pool in our legs, especially when we’re sitting. The following stretch can help manage the physical manifestations of anxiety while waiting to speak. Start with both feet flat on the floor. Raise your back heels off the floor and flex and release your calf muscles. You can flex and release your calves once before putting your heels back down and repeating, or you can flex a few times on each repetition. Doing this three to five times should sufficiently get your blood and energy moving around. Stretching your wrists can also help move energy around in your upper body, since our huge amounts of typing and using other electronic controllers put a lot of stress on this intersection of muscles, tendons, and bones. Point one hand up at the wrist joint, like you’re waving at someone. Then use your other hand to pull, gently, the hand that’s pointing up back toward your elbow. Stop pulling once you feel some tension. Hold the hand there for a few seconds and release. Then point the hand down at the wrist joint like you’re pointing at something on the floor, and use the other hand to push the hand back toward your elbow. Again, stop pushing when you feel the tension, hold the stretch for a few seconds, and release. You can often do this stretch discretely as well while waiting to speak. Vocal warm-up exercisesExercises targeted at warming up muscles of the face and mouth to reduce fluency issues that occur when speaking and contribute to speaking anxiety. are a good way to warm up your face and mouth muscles, which can help prevent some of the fluency issues that occur when speaking. Newscasters, singers, and other professional speakers use vocal warm-ups. I lead my students in vocal exercises before speeches, which also helps lighten the mood. We all stand in a circle and look at each other while we go through our warm-up list. For the first warm-up, we all make a motorboat sound, which makes everybody laugh. The full list of warm-ups follows and contains specific words and exercises designed to warm up different muscles and different aspects of your voice. After going through just a few, you should be able to feel the blood circulating in your face muscles more. It’s a surprisingly good workout! Clench your teeth and say, “N, N, N, N,” to stretch your cheek muscles. Say “Mum” five times, and open your mouth and eyes wide each time you say it. Say “Puh” five times, making sure to use your diaphragm to enunciate the h.
Say “Red Rover” ten times, overenunciating each r.
Say “Wilbur” ten times, overenunciating the w and r.
Say “Bumblebee” ten times, enunciating each b. Say “Red letter, yellow letter” five times, making sure to distinctly pronounce each word. Say “Selfish shellfish” five times, making sure to distinctly pronounce each word. Say “Unique New York” five times, enunciating the q and k.
As you can see in this section, there are many factors that contribute to speaking anxiety, and there are many ways to address it. The following is a list of the top ten ways to reduce speaking anxiety that I developed with my colleagues, which helps review what we’ve learned. Remember, you are not alone. Public speaking anxiety is common, so don’t ignore it—confront it. Remember, you can’t literally “die of embarrassment.” Audiences are forgiving and understanding. Remember, it always feels worse than it looks. Take deep breaths. It releases endorphins, which naturally fight the adrenaline that causes anxiety. Look the part. Dress professionally to enhance confidence. Channel your nervousness into positive energy and motivation. Start your outline and research early. Better information = higher confidence. Visualize success through positive thinking. Prepare, prepare, prepare! Practice is a speaker’s best friend. How Much Emphasis Should We Place on Delivery? Before you read the rest of the chapter, take some time to think about the balance between the value of content and delivery in a speech. We know it’s important to have solid content and to have an engaging and smooth delivery to convey that content, but how should each category be weighted and evaluated? Most people who have made it to college can put the time and effort into following assignment guidelines to put together a well-researched and well-organized speech. But some people are naturally better at delivering speeches than others. Some people are more extroverted, experience less public speaking anxiety, and are naturally more charismatic than others. Sometimes a person’s delivery and charisma might distract an audience away from critically evaluating the content of their speech. Charismatic and well-liked celebrities and athletes, for example, are used to endorse products and sell things to the public. We may follow their advice because we like them, instead of basing our choice on their facts or content. Aristotle, Cicero, and other notable orators instructed that delivery should be good enough to present the material effectively but not so good or so bad that it draws attention to itself. But in today’s celebrity culture, the bling or packaging is sometimes more valued than the contents. This leads us to some questions that might help us unpack the sometimes tricky relationship between content and delivery. Do you think worries about content or delivery contribute more to speaking anxiety? Explain your choice. How should someone be evaluated who works hard to research, organize, and write a speech, but doesn’t take the time to practice so they have a good delivery? What if they practice, but still don’t deliver the speech well on speech day? How should we evaluate a speaker who delivers an engaging speech that gets the audience laughing and earns a big round of applause but doesn’t verbally cite sources or present well-organized ideas? Is it ethical for someone to use their natural charisma or speaking abilities to win over an audience rather than relying on the merit and strength of their speech content? In what speaking situations would this be more acceptable? Less acceptable? Getting integrated: Public speaking anxiety is a form of communication apprehension (CA) that is commonly experienced by many people and can be effectively managed using a variety of strategies. While we most often think of public speaking anxiety as an issue in the classroom and workplace, it can affect communication in personal and civic contexts as well. Systematic desensitization helps lessen public speaking anxiety through repeated exposure to real or imagined public speaking scenarios. Cognitive restructuring addresses public speaking by replacing negative thoughts with more positive thoughts, and COM therapy can help you view public speaking as a conversation rather than a performance. Skills training allows you to focus on improving specific skills related to public speaking, which can increase confidence and lead to further skill development. Physical relaxation exercises like deep breathing and stretching allow us to voluntarily use our bodies to address involuntary bodily reactions to anxiety. Test your speaking anxiety using McCroskey’s “Personal Report of Public Speaking Anxiety” (PRPSA). You can access the scale here: http://www.jamescmccroskey.com/measures/prpsa.htm. Follow the directions to determine your score. Do you agree with the result? Why or why not? Of the strategies for managing public speaking anxiety listed in the chapter (systematic desensitization, cognitive restructuring, skills training, physical relaxation exercises), which do you think would be most useful for you and why? When you take a communication course like this one, you are automatically engaging in some skills training. What are some public speaking skills that you are already good at? What are some skills that you should work on? Write out three goals you would like to accomplish for your next speech that focus on improving your public speaking skills. Identify the four methods of speech delivery. Evaluate the strengths and weaknesses of each delivery method. 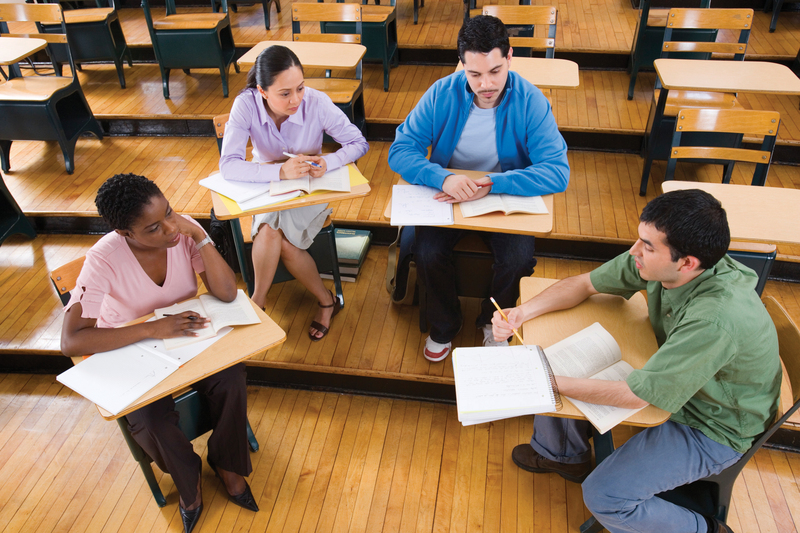 Discuss strategies for making speech practice sessions more effective. There are many decisions that must be made during the speech-making process. Making informed decisions about delivery can help boost your confidence and manage speaking anxiety. In this section, we will learn some strengths and weaknesses of various delivery methods and how to make the most of your practice sessions. Different speaking occasions call for different delivery methods. While it may be acceptable to speak from memory in some situations, lengthy notes may be required in others. The four most common delivery methods are impromptu, manuscript, memorized, and extemporaneous. When using impromptu deliveryDelivering a speech with little to no time to prepare., a speaker has little to no time to prepare for a speech. This means there is little time for research, audience analysis, organizing, and practice. For this reason, impromptu speaking often evokes higher degrees of speaking anxiety than other delivery types. Although impromptu speaking arouses anxiety, it is also a good way to build public speaking skills. Using some of the exercises for managing speaking anxiety that were discussed earlier in this chapter can help a speaker better manage the challenges of impromptu speaking. Only skilled public speakers with much experience are usually able to “pull off” an impromptu delivery without looking unprepared. Otherwise, a speaker who is very familiar with the subject matter can sometimes be a competent impromptu speaker, because their expertise can compensate for the lack of research and organizing time. When Mark Twain famously said, “It usually takes me more than three weeks to prepare a good impromptu speech,” he was jokingly pointing out the difficulties of giving a good impromptu speech, essentially saying that there is no such thing as a good impromptu speech, as good speeches take time to prepare. We don’t always have the luxury of preparation, though. So when speaking impromptu, be brief, stick to what you know, and avoid rambling. Quickly organize your thoughts into an introduction, body, and conclusion. Try to determine three key ideas that will serve as the basis of your main points. In what situations would impromptu speaking be used? Since we’ve already started thinking of the similarities between public speaking and conversations, we can clearly see that most of our day-to-day interactions involve impromptu speaking. When your roommate asks you what your plans for the weekend are, you don’t pull a few note cards out of your back pocket to prompt your response. This type of conversational impromptu speaking isn’t anxiety inducing because we’re talking about our lives, experiences, or something we’re familiar with. This is also usually the case when we are asked to speak publicly with little to no advance warning. For example, if you are at a meeting for work and you are representing the public relations department, a colleague may ask you to say a few words about a recent news story involving a public relations misstep of a competing company. In this case, you are being asked to speak on the spot because of your expertise. A competent communicator should anticipate instances like this when they might be called on to speak, so they won’t be so surprised. Of course, being caught completely off guard or being asked to comment on something unfamiliar to you creates more anxiety. In such cases, do not pretend to know something you don’t, as that may come back to hurt you later. You can usually mention that you do not have the necessary background information at that time but will follow up later with your comments. Salespeople on home-shopping television shows are masters of impromptu speaking. They obviously have sales training and have built up a repertoire of adjectives and sayings that entice an audience to buy. But they are often speaking impromptu when interacting with a guest on the show or the customers who call in. Their ability to remain animated and fluent in their delivery with little time to prepare comes from much experience. Politicians, lawyers, teachers, journalists, and spokespeople engage in impromptu speaking regularly. Content and delivery are spontaneous, which can make the speech more engaging (if a speaker’s anxiety is under control). It is typically the most anxiety-inducing delivery method, since speakers do not have time to prepare or practice the speech. Speakers may get off topic or ramble if they did not set up some structure to guide them. Speakers may be tempted to overstate or mislead an audience about the extent of their knowledge or expertise if asked to speak about something they aren’t familiar with. Speaking from a written or printed document that contains the entirety of a speech is known as manuscript deliveryDelivering a speech from a written or printed document that contains the entirety of the speech.. Manuscript delivery can be the best choice when a speech has complicated information and/or the contents of the speech are going to be quoted or published. Despite the fact that most novice speakers are not going to find themselves in that situation, many are drawn to this delivery method because of the security they feel with having everything they’re going to say in front of them. Unfortunately, the security of having every word you want to say at your disposal translates to a poorly delivered and unengaging speech. Even with every word written out, speakers can still have fluency hiccups and verbal fillers as they lose their place in the manuscript or get tripped up over their words. The alternative, of course, is that a speaker reads the manuscript the whole time, effectively cutting himself or herself off from the audience. One way to make a manuscript delivery more engaging is through the use of a teleprompter. Almost all politicians who give televised addresses use teleprompters. In Figure 10.1 "President Obama’s Teleprompter System", you can see President Obama’s teleprompter system. Newscasters and politicians frequently use teleprompters so they can use manuscript delivery but still engage with the audience. 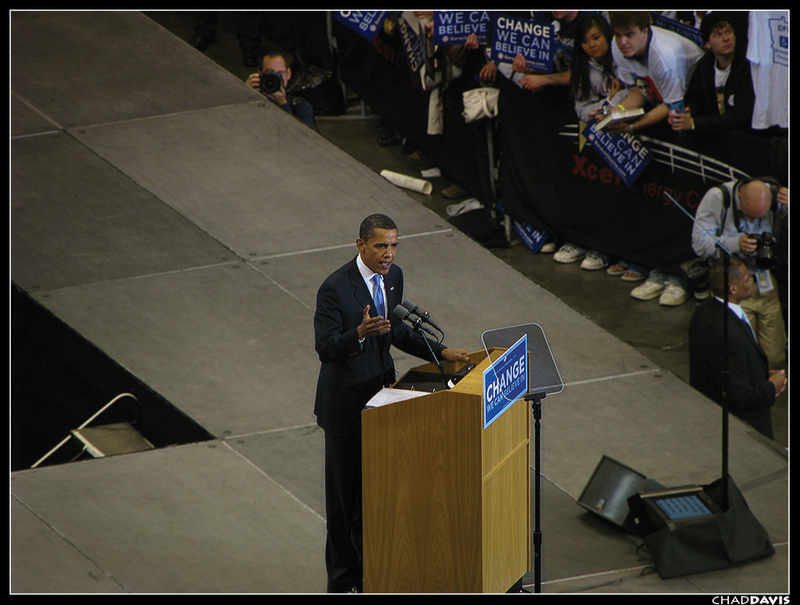 Source: Photo courtesy of Chad Davis, http://commons.wikimedia.org/wiki/File:20080603_Obama_Speaks_on_Nomination_Victory_Night.jpg. You may not even notice them, as the technology has improved to give the illusion that a speaker is engaged with the audience and delivering a speech from memory. The Plexiglas sheets on poles that surround the president during the inauguration and State of the Union addresses are cleverly hidden teleprompters. Even these useful devices can fail. A quick search for “teleprompter fail” on YouTube will yield many examples of politicians and newscasters who probably wish they had a paper backup of their speech. Since most of us will likely not have opportunities to speak using a teleprompter, great care should be taken to ensure that the delivery is effective. To make the delivery seem more natural, print the speech out in a larger-than-typical font, triple-space between lines so you can easily find your place, use heavier-than-normal paper so it’s easy to pick up and turn the pages as needed, and use a portfolio so you can carry the manuscript securely. 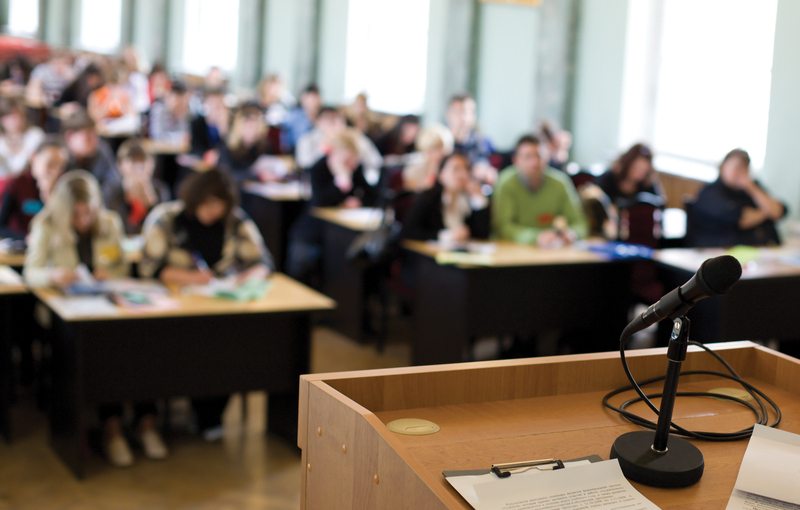 The speaker can include precise or complex information such as statistics or quotes. The entire content of the speech is available for reference during the delivery. The speech will be consistent in terms of content and time length, which is beneficial if a speech will be delivered multiple times. Engagement with the audience is challenging, because the speaker must constantly reference the manuscript (unless a teleprompter is used). Speakers are unable to adapt information to audience reactions, since they are confined to the content of the manuscript. Speakers may be tempted to read the entire speech because they didn’t practice enough or because they get nervous. Speakers who are able to make eye contact with the audience may still sound like they are reading the speech unless they employ proper vocal variety, pacing, and pauses. Completely memorizing a speech and delivering it without notes is known as memorized deliveryDelivering a speech word for word from memory.. Some students attempt to memorize their speech because they think it will make them feel more confident to not have to look at their notes; however, when their anxiety level spikes at the beginning of their speech and their mind goes blank for a minute, many admit they should have chosen a different delivery method. When using any of the other delivery methods, speakers still need to rely on their memory. An impromptu speaker must recall facts or experiences related to their topic, and speakers using a manuscript want to have some of their content memorized so they do not read their entire speech to their audience. The problem with memorized delivery overall is that it puts too much responsibility on our memory, which we all know from experience is fallible. When memorizing, most people use rote memorization techniques, which entail reading and then reciting something over and over until it is committed to memory. One major downfall of this technique is its effect on speaking rate. When we memorize this way, we end up going over the early parts of a speech many more times than the later parts. As you memorize one sentence, you add on another, and so on. By the time you’re adding on later parts of your speech, you are likely speed talking through the earlier parts because you know them by heart at that point. As we’ll discuss more later, to prevent bad habits from practice from hurting our speech delivery, speakers should practice a speech the exact way they want to deliver it to their audience. Fast-paced speaking during practice will likely make its way into the actual delivery of the speech. Delivery also suffers when speaking from memory if the speaker sounds like he or she is reciting the speech. Rote memorization tasks that many of us had to do in school have left their mark on our memorized delivery. Being made to recite the pledge of allegiance, the preamble to the Constitution, and so on didn’t enhance our speaking abilities. I’ve observed many students whose speeches remind me of the sound of school children flatly going through the motions of reciting the Pledge of Allegiance. It’s the “going through the motions” impression that speakers should want to avoid. 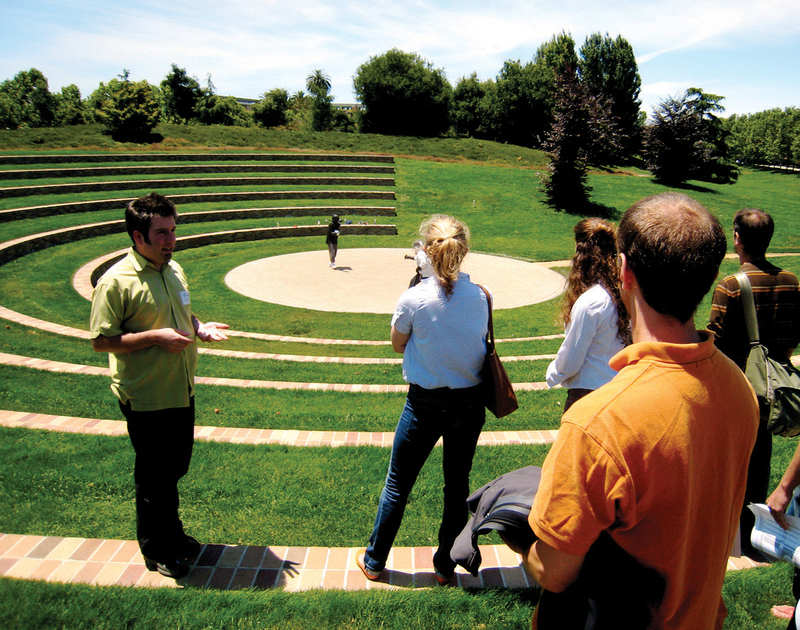 Memorized delivery is a good option for people like tour guides, who need to move while speaking and be interactive with an audience. Source: Photo courtesy of John Lambert Pearson, http://www.flickr.com/photos/orphanjones/896596938. Even with much practice, our memories can fail. If you do opt to use memorized delivery, make sure you have several “entry points” determined, so you can pick up at spots other than the very beginning of a speech if you lose your place and have to start again. Memorized delivery is very useful for speakers who are going to be moving around during a speech when carrying notes would be burdensome. Think of the tour guide who showed you around your college campus. As someone who used to give college tours, I can attest to the fact that we all had speeches memorized, which was a good thing. It’s already difficult enough to walk backward while facing a group of people and lead them across roads and up stairs. Think about how dangerous it would be if the tour guide were trying to hold onto and reference a stack of note cards at the same time! In summary, I only recommend memorized delivery in cases where the speech is short (only one to two minutes), the speech is personal (like a brief toast), or the speech will be repeated numerous times (like a tour guide’s spiel), and even in these cases, it may be perfectly fine to have notes. Many students think that their anxiety and/or delivery challenges will be fixed if they just memorize their speech only to find that they are more anxious and have more problems. Speakers can include precise or complex information such as statistics or quotes (if they have put the time into memorization). Speakers can directly engage with the audience without worrying about referencing notes. The speech will be consistent in terms of content and time-length, which is beneficial if a speech will be delivered multiple times. It is the most time-consuming delivery method. Speakers are unable to adapt information to audience reactions, since they are confined to the content they memorized. If speakers lose their place in the speech, they will likely have to start over. Since everything is preplanned, it is difficult to make the speech content and delivery seem genuine (i.e., humor may seem “canned” or corny). The speech can sound like a recitation if the proper vocal variety and pacing are not used. Extemporaneous deliveryDelivering a speech using a keyword and/or key-phrase outline after memorizing the general structure and main points of a speech. entails memorizing the overall structure and main points of a speech and then speaking from keyword/key-phrase notes. This delivery mode brings together many of the strengths of the previous three methods. Since you only internalize and memorize the main structure of a speech, you don’t have to worry as much about the content and delivery seeming stale. Extemporaneous delivery brings in some of the spontaneity of impromptu delivery but still allows a speaker to carefully plan the overall structure of a speech and incorporate supporting materials that include key facts, quotations, and paraphrased information. You can also more freely adapt your speech to fit various audiences and occasions, since every word and sentence isn’t predetermined. This can be especially beneficial when a speech will be delivered multiple times. The minilectures I give in my classes, for example, are good examples of extemporaneous delivery. Even though I’ve presented the basic content of this chapter dozens of times over the years, each presentation has been different, because I can vary the examples and amount of elaboration that I add to the core content that I’ve memorized. For example, I may spend more time discussing speaking anxiety with a class that has expressed more apprehension about public speaking. I also change the example videos I show to connect to ever-changing current events or popular culture. When preparing a speech that you will deliver extemporaneously, you will want to start practicing your speech early and then continue to practice as you revise your content. Investing quality time and effort into the speech-outlining process helps with extemporaneous delivery. As you put together your outline, you are already doing the work of internalizing the key structure of your speech. Read parts of your outline aloud as you draft them to help ensure they are written in a way that makes sense and is easy for you to deliver. By the time you complete the formal, full-sentence outline, you should have already internalized much of the key information in your speech. Now, you can begin practicing with the full outline. As you become more comfortable with the content of your full outline, start to convert it into your speaking outline. Take out information that you know well and replace it with a keyword or key phrase that prompts your memory. You’ll probably want to leave key quotes, facts, and other paraphrased information, including your verbal source citation information, on your delivery outline so you make sure to include it in your speech. Once you’ve converted your full outline into your speaking outline, practice it a few more times, making sure to take some time between each practice session so you don’t inadvertently start to memorize the speech word for word. The final product should be a confident delivery of a well-organized and structured speech that is conversational and adaptable to various audiences and occasions. Speech content and delivery appear more spontaneous and natural, making it more conversational, since the speaker is using a keyword/key-phrase outline. Speakers can include quotes or complex information on their speaking outline for easy reference. Speakers can adapt information and delivery to specific audiences, occasions, and audience reactions, since they are not confined to the content of a manuscript or what they memorized. Since the speech is so adaptable, it can be difficult to ensure the speech will be the exact same length each time. It is perhaps not the best option when exact wording is expected. Speakers must find a balance between having too much content on their speaking outline, which may cause them to read, and too little content, which may lead to fluency hiccups. Practicing a speech is essential, and practice sessions can be more or less useful depending on how you approach them. There are three primary phases to the practice process. In the first phase, you practice as you’re working through your ideas and drafting your outline. In the second, you practice for someone and get feedback. In the third, you put the finishing touches on the speech. Start practicing your speech early, as you are working through your ideas, by reading sections aloud as you draft them into your working outline. This will help ensure your speech is fluent and sounds good for the audience. Start to envision the audience while you practice and continue to think about them throughout the practicing process. This will help minimize anxiety when you actually have them sitting in front of you. Once you have completed your research and finished a draft of your outline, you will have already practiced your speech several times as you were putting it together. Now, you can get feedback on the speech as a whole. You begin to solicit feedback from a trusted source in the second phase of practicing your speech. This is the most important phase of practicing, and the one that most speakers do not complete. Beginning speakers may be nervous to practice in front of someone, which is to be expected. But review the strategies for managing anxiety discussed earlier in this chapter and try to face that anxiety. After all, you will have to face a full audience when you deliver the speech, so getting used to speaking in front of someone can only help you at this point. Choose someone who will give you constructive feedback on your speech, not just unconditional praise or criticism. Before you practice for them, explain the assignment or purpose of the speech. When practicing for a classroom speech, you may even want to give the person the assignment guidelines or a feedback sheet that has some key things for them to look for. Ask them for feedback on content and delivery. Almost anyone is good at evaluating delivery, but it’s more difficult to evaluate content. And, in most cases, the content of your speech will be account for more of your grade or what you will be evaluated on for work than the delivery. Also begin to time your speech at this point, so you can determine if it meets any time limits that you have. In addition to practicing for a trusted source for feedback, you may want to audio or video record your speech. This can be useful because it provides an objective record that you can then compare with the feedback you got from your friend and to your own evaluation of your speech. The most important part of this phase is incorporating the feedback you receive into your speech. If you practice for someone, get feedback, and then don’t do anything with the feedback, then you have wasted your time and their time. Use the feedback to assess whether or not you met your speaking goals. Was your thesis supported? Was your specific purpose met? Did your speech conform to any time limits that were set? Based on your answers to these questions, you may need to make some changes to your content or delivery, so do not put this part of practicing off to the last minute. Once the content has been revised as needed, draft your speaking outline and move on to the next phase of practice. 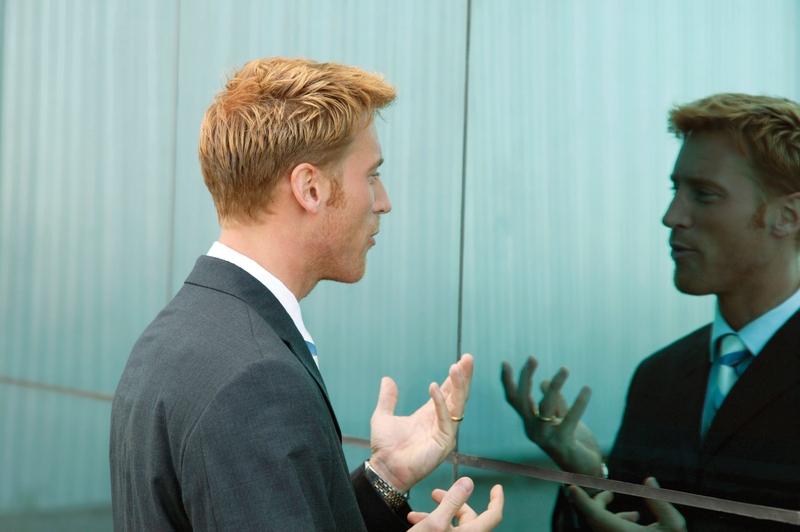 You can practice your speech in front of a mirror to gauge your use of facial expressions and gestures. In addition, practice in front of a couple people for feedback. During the third and final phase of practice, you are putting the finishing touches on your speech. You should be familiar with the content based on your early practice sessions. You have also gotten feedback and incorporated that feedback into the speech. Your practice sessions at this point should precreate, as much as possible, the conditions in which you will be giving your speech. You should have your speaking outline completed so you can practice with it. It’s important to be familiar with the content on your note cards or speaking outline so you will not need to rely on it so much during the actual delivery. You may also want to practice in the type of clothing you will be wearing on speech day. This can be useful if you are wearing something you don’t typically wear—a suit for example—so you can see how it might affect your posture, gestures, and overall comfort level. If possible, at least one practice session in the place you will be giving the speech can be very helpful, especially if it’s a room you are not familiar with. Make sure you’re practicing with any visual aids or technology you will use so you can be familiar with it and it doesn’t affect your speech fluency. Continue to time each practice round. If you are too short or too long, you will need to go back and adjust your content some more. Always adjust your content to fit the time limit; do not try to adjust your delivery. Trying to speed talk or stretch things out to make a speech faster or longer is a mistake that will ultimately hurt your delivery, which will hurt your credibility. The overall purpose of this phase of practicing is to minimize surprises that might throw you off on speech day. Do start practicing sections of your speech early, as you draft your outline. Do practice for someone for feedback. Do time yourself once a draft of the speech is completed and adjust the speech as needed to conform to time limits. Do deliver the speech the way you want it to be when you deliver it for your audience (use the rate, volume, vocal variety, pauses, and emphasis you plan to use on speech day). Don’t only practice in front of a mirror (practicing once in front of a mirror can help you gauge your facial expressions and other aspects of delivery, but that shouldn’t be the only way you practice). Don’t only practice in your head (we have a tendency to go too fast when we practice in our head, and you need to get practice saying the words of your speech to help lessen fluency hiccups). Don’t practice too much. It’s best to practice a few times in the days leading up to the speech, making sure to leave several hours between practice sessions. Practicing too much can lead you to become bored with your content, which could lead to delivery that sounds like a recitation. The four methods of delivering a speech are impromptu, manuscript, memorized, and extemporaneous delivery. Impromptu delivery evokes higher levels of speaking anxiety because a speaker has little to no time to prepare the speech; however, this method can increase public speaking skills for people who enjoy thinking on their feet. Manuscript delivery entails speaking from a manuscript that contains a word-for-word transcript of your speech. This delivery method can be good for speeches that contain complex information that will be published or quoted but can be challenging because speakers may read their speech, which lessens engagement with the audience. Memorized delivery entails speaking from memory. Speakers with a reliable memory will be able to include specific information and engage the audience freely. This method is the most time-consuming delivery option and may come across as a recitation instead of an engaging speech. Extemporaneous delivery entails memorizing the general structure of a speech, not every word, and then delivering the speech from a keyword outline. Having the keyword outline allows a speaker to include specific information and references while remaining adaptable to the occasion and audience since every word isn’t planned out. Practicing your speech should occur in three phases. First, practice as you are drafting the outline to help you process through your speech ideas. Second, practice for someone and get feedback and record your speech for self-evaluation. Use this feedback to make appropriate changes to your speech. Third, put the finishing touches on the speech: make needed adjustments to the content to meet time limits, become familiar with your speaking outline, and precreate the conditions of speech day for your final few practice sessions. Which delivery methods have you used before? Which did you like the best and why? Which delivery method would you most prefer a speaker to use if you were an audience member and why? Have you ever had any “surprises” come up during a speech that you could have prevented with more effective practice sessions? If so, explain. If not, list some surprises that good practice sessions could help prevent. Using the suggestions in the chapter, make a timeline for practicing your next speech. Include specific dates and make a list of things you plan to do during each of the three phases of practice. Identify elements of vocal delivery that make a speech more engaging. Identify elements of vocal delivery that make a speech clearer. Discuss the relationship between vocal delivery and speaker credibility. Vocal delivery includes components of speech delivery that relate to your voice. These include rate, volume, pitch, articulation, pronunciation, and fluency. Our voice is important to consider when delivering our speech for two main reasons. First, vocal delivery can help us engage and interest the audience. Second, vocal delivery helps ensure that our ideas are communicated clearly. We have all had the displeasure of listening to an unengaging speaker. Even though the person may care about his or her topic, an unengaging delivery that doesn’t communicate enthusiasm will translate into a lack of interest for most audience members. Although a speaker can be visually engaging by incorporating movement and gestures, which we will discuss more later, a flat or monotone vocal delivery can be sedating or even annoying. Incorporating vocal variety in terms of rate, volume, and pitch is key to being a successful speaker. RateHow fast or slow you speak. of speaking refers to how fast or slow you speak. If you speak too fast, your audience will not be able to absorb the information you present. If you speak too slowly, the audience may lose interest. The key is to vary your rate of speaking in a middle range, staying away from either extreme, in order to keep your audience engaged. 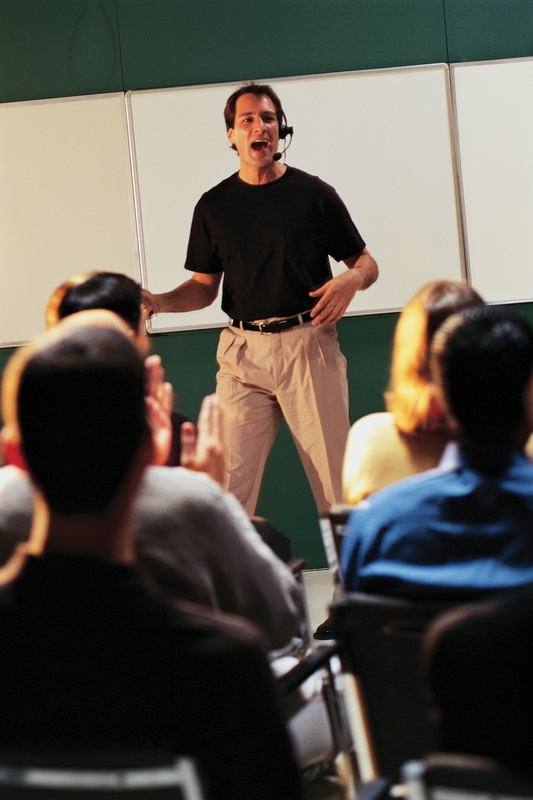 In general, a higher rate of speaking signals that a speaker is enthusiastic about his or her topic. Speaking slowly may lead the audience to infer that the speaker is uninterested, uninformed, or unprepared to present his or her own topic. These negative assumptions, whether they are true or not, are likely to hurt the credibility of the speaker. Having evaluated thousands of speeches, I can say that, in terms of rate, the issue speakers face is speaking too fast. The goal is to speak at a rate that will interest the audience and will effectively convey your information. Speaking at a slow rate throughout a speech would likely bore an audience, but that is not a common occurrence. Some people naturally speak faster than others, which is fine, but we can all alter our rate of speaking with practice. If you find that you are a naturally fast speaker, make sure that you do not “speed talk” through your speech when practicing it. Even if you try to hold back when actually delivering your speech, you may fall back into your practice routine and speak too fast. You can also include reminders to “slow down” on your speaking outline. VolumeHow loud or soft you speak. refers to how loud or soft your voice is. As with speaking rate, you want to avoid the extremes of being too loud or too soft, but still vary your volume within an acceptable middle range. When speaking in a typically sized classroom or office setting that seats about twenty-five people, using a volume a few steps above a typical conversational volume is usually sufficient. When speaking in larger rooms, you will need to project your voice. You may want to look for nonverbal cues from people in the back rows or corners, like leaning forward or straining to hear, to see if you need to adjust your volume more. Obviously, in some settings, a microphone will be necessary to be heard by the entire audience. Like rate, audiences use volume to make a variety of judgments about a speaker. Softer speakers are sometimes judged as meek, which may lead to lowered expectations for the speech or less perceived credibility. Loud speakers may be seen as overbearing or annoying, which can lead audience members to disengage from the speaker and message. Be aware of the volume of your voice and, when in doubt, increase your volume a notch, since beginning speakers are more likely to have an issue of speaking too softly rather than too loudly. Speak a couple steps above your regular volume for speeches that occur in typically sized classrooms or meeting rooms that seat twenty to forty people. A microphone may be necessary for larger groups or rooms. PitchHow high or low your voice is. refers to how high or low a speaker’s voice is. As with other vocal qualities, there are natural variations among people’s vocal pitch. Unlike rate and volume, there are more physiological limitations on the control we have over pitch. For example, males generally have lower pitched voices than females. Despite these limitations, each person still has the capability to intentionally change their pitch across a range large enough to engage an audience. Changing pitch is a good way to communicate enthusiasm and indicate emphasis or closure. In general, our pitch goes up when we are discussing something exciting. Our pitch goes down slightly when we emphasize a serious or important point. Lowering pitch is also an effective way to signal transitions between sections of your speech or the end of your speech, which cues your audience to applaud and avoids an awkward ending. Of the vocal components of delivery discussed so far, pitch seems to give beginning speakers the most difficulty. There is a stark difference between the way I hear students speak before and after class and the way they speak when they get in front of the class. It’s like giving a speech temporarily numbs their ability to vary their pitch. Record yourself practicing your speech to help determine if the amount of pitch variety and enthusiasm you think you convey while speaking actually comes through. Speakers often assume that their pitch is more varied and their delivery more enthusiastic than the audience actually perceives it to be. Many of my students note this on the self-evaluations they write after viewing their recorded speech. Overall, the lesson to take away from this section on vocal delivery is that variety is key. Vocal varietyVariations in rate, volume, and pitch that make a speech more engaging. includes changes in your rate, volume, and pitch that can make you look more prepared, seem more credible, and be able to engage your audience better. Employing vocal variety is not something that takes natural ability or advanced skills training. It is something that beginning speakers can start working on immediately and everyone can accomplish. The key is to become aware of how you use your voice when you speak, and the best way to do this is to record yourself. We all use vocal variety naturally without thinking about it during our regular conversations, and many of us think that this tendency will translate over to our speaking voices. This is definitely not the case for most beginning speakers. Unlike in your regular conversations, it will take some awareness and practice to use vocal variety in speeches. I encourage students to make this a delivery priority early on. Since it’s something anyone can do, improving in this area will add to your speaking confidence, which usually translates into better speeches and better grades further on. In order to be an effective speaker, your audience should be able to understand your message and digest the information you present. Audience members will make assumptions about our competence and credibility based on how we speak. As with other aspects of speech delivery, many people are not aware that they have habits of speech that interfere with their message clarity. Since most of our conversations are informal and take place with people we know, many people don’t make a concerted effort to articulate every word clearly and pronounce every word correctly, and most of the people we talk to either don’t notice our errors or don’t correct us if they do notice. Since public speaking is generally more formal than our conversations, we should be more concerned with the clarity of our speech. ArticulationThe clarity of sounds and words we produce. refers to the clarity of sounds and words we produce. If someone is articulate, they speak words clearly, and speakers should strive to speak clearly. Poor articulation results when speakers do not speak clearly. For example, a person may say dinnt instead of didn’t, gonna instead of going to, wanna instead of want to, or hunnerd instead of hundred. Unawareness and laziness are two common challenges to articulation. As with other aspects of our voice, many people are unaware that they regularly have errors in articulation. Recording yourself speak and then becoming a higher self-monitor are effective ways to improve your articulation. Laziness, on the other hand, requires a little more motivation to address. Some people just get in the habit of not articulating their words well. I’m sure we all know someone who mumbles when they speak or slurs their words together. From my experience, this is a problem that I’ve noticed more among men than women. Both mumbling and slurring are examples of poor articulation. In more informal settings, this type of speaking may be acceptable, but in formal settings, it will be negatively evaluated, which will hurt a speaker’s credibility. Perhaps the promise of being judged more favorably, which may help a person become more successful, is enough to motivate a mumbler to speak more clearly. When combined with a low volume, poor articulation becomes an even greater problem. Doing vocal warm-ups like the ones listed in Section 10.1 "Managing Public Speaking Anxiety" or tongue twisters can help prime your mouth, lips, and tongue to articulate words more clearly. When you notice that you have trouble articulating a particular word, you can either choose a different word to include in your speech or you can repeat it a few times in a row in the days leading up to your speech to get used to saying it. Unlike articulation, which focuses on the clarity of words, pronunciationSpeaking words correctly. refers to speaking words correctly, including the proper sounds of the letters and the proper emphasis. Mispronouncing words can damage a speaker’s credibility, especially when the correct pronunciation of a word is commonly known. I have actually heard someone, presenting on the topic of pronunciation, mispronounce the word pronunciation, saying “pro-NOUN-ciation” instead of “pro-NUN-ciation.” In such a case, it would not be unwarranted for the audience to question the speaker’s expertise on the subject. We all commonly run into words that we are unfamiliar with and therefore may not know how to pronounce. I offer my students three suggestions when faced with this problem. The first is to look the word up in an online dictionary. Many dictionaries have a speaker icon with their definitions, and when you click on it, you can hear the correct pronunciation of a word. Some words have more than one pronunciation—for example, Caribbean—so choosing either of the accepted pronunciations is fine. Just remember to consistently use that pronunciation to avoid confusing your audience. If a word doesn’t include an audio pronunciation, you can usually find the phonetic spelling of a word, which is the word spelled out the way it sounds. There will occasionally be words that you can’t locate in a dictionary. These are typically proper nouns or foreign words. In this case, I suggest the “phone-a-friend” strategy. Call up the people you know who have large vocabularies or are generally smart when it comes to words, and ask them if they know how to pronounce it. If they do, and you find them credible, you’re probably safe to take their suggestion. The third option is to “fake it ‘til you make it” and should only be used as a last resort. If you can’t find the word in a dictionary and your smart friends don’t know how to pronounce it, it’s likely that your audience will also be unfamiliar with the word. In that case, using your knowledge of how things are typically pronounced, decide on a pronunciation that makes sense and confidently use it during your speech. Most people will not question it. In the event that someone does correct you on your pronunciation, thank him or her for correcting you and adjust your pronunciation. FluencyThe flow of your speaking. refers to the flow of your speaking. To speak with fluency means that your speech flows well and that there are not many interruptions to that flow. There are two main disfluencies, or problems that affect the flow of a speech. Fluency hiccupsUnintended pauses in a speech. are unintended pauses in a speech that usually result from forgetting what you were saying, being distracted, or losing your place in your speaking notes. Fluency hiccups are not the same as intended pauses, which are useful for adding emphasis or transitioning between parts of a speech. While speakers should try to minimize fluency hiccups, even experienced speakers need to take an unintended pause sometimes to get their bearings or to recover from an unexpected distraction. Fluency hiccups become a problem when they happen regularly enough to detract from the speaker’s message. Verbal fillersWords that speakers use to fill in a gap between what they were saying and what they will say next. are words that speakers use to fill in a gap between what they were saying and what they’re saying next. Common verbal fillers include um, uh, ah, er, you know, and like. The best way to minimize verbal fillers is to become a higher self-monitor and realize that you use them. Many students are surprised when they watch the video of their first speech and realize they said “um” thirty times in three minutes. Gaining that awareness is the first step in eliminating verbal fillers, and students make noticeable progress with this between their first and second speeches. If you do lose your train of thought, having a brief fluency hiccup is better than injecting a verbal filler, because the audience may not even notice the pause or may think it was intentional. Lack of preparation. Effective practice sessions are the best way to prevent fluency hiccups. Not writing for speaking. If you write your speech the way you’ve been taught to write papers, you will have fluency hiccups. You must translate the written words into something easier for you to present orally. To do this, read your speech aloud and edit as you write to make sure your speech is easy for you to speak. A poorly prepared speaking outline. Whether it is on paper or note cards, sloppy writing, unorganized bullet points, or incomplete/insufficient information on a speaking outline leads to fluency hiccups. Distractions. Audience members and the external environment are unpredictable. Hopefully audience members will be polite and will silence their phones, avoid talking while the speaker is presenting, and avoid moving excessively. There could also be external noise that comes through a door or window. A speaker can also be distracted by internal noise such as thinking about other things. As many people and organizations are trying to do more with smaller budgets, and new software becomes available, online presentations are becoming more common. Whether using a Webinar format, a WebEx, Skype, FaceTime, Elluminate Live, or some other program, the live, face-to-face audience is now mediated through a computer screen. Despite this change in format, many of the same basic principles of public speaking apply when speaking to people virtually. Yet many business professionals seem to forget the best practices of public speaking when presenting online or don’t get that they apply in both settings. The website TheVirtualPresenter.com offers many tips for presenting online that we’ve covered in this book, including be audience focused, have engaging delivery, and use visual aids effectively.Roger Courville, “Delivery,” TheVirtualPresenter.com, accessed November 5, 2012, http://thevirtualpresenter.com/category/delivery. Yet speakers need to think about some of these things differently when presenting online. We have natural ways to engage an audience when presenting face-to-face, but since many online presentations are only one-way in terms of video, speakers have to rely on technology like audience polls, live chat, or options for audience members to virtually raise their hand when they have a question to get feedback while speaking. Also, in some formats, the audience can only see the presenter’s computer desktop or slide show, which pulls attention away from physical delivery and makes vocal delivery and visual aids more important. Extemporaneous delivery and vocal variety are still key when presenting online. Reading from your slides or having a monotone voice will likely not make a favorable impression on your audience. The lesson to take away is that presenting online requires the same skills as presenting in person, so don’t let the change in format lead you to make mistakes that will make you a less effective speaker. Have you ever presented online or been an audience member for an online presentation? If so, describe your experience and compare it to face-to-face speaking. What are some of the key differences between presenting online and presenting in person that a speaker should consider? How might online presentations play into your future career goals? What types of presentations do you think you would give? What could you do to ensure the presentations are effective? Speakers should use vocal variety, which is changes in rate, volume, and pitch, to make a speech more engaging. Speakers should use proper articulation and pronunciation to make their message clear. Interruptions to the fluency of a speech, including fluency hiccups and verbal fillers, detract from the speaker’s message and can lessen a speaker’s credibility. Record yourself practicing your speech. How does your speech sound in terms of vocal variety? Cite specific examples. Listen to your recorded speech again. How would you evaluate your articulation and pronunciation? Cite specific examples. Over the course of a day, take note of verbal fillers that you tend to use. List them here so you can be a higher self-monitor and begin to notice and lessen your use of them. Explain the role of facial expressions and eye contact in speech delivery. Explain the role of posture, gestures, and movement in speech delivery. Explain the connection between personal appearance and credibility in speech delivery. Explain the connection between visual aids and speech delivery. Many speakers are more nervous about physical delivery than vocal delivery. Putting our bodies on the line in front of an audience often makes us feel more vulnerable than putting our voice out there. Yet most audiences are not as fixated on our physical delivery as we think they are. Knowing this can help relieve some anxiety, but it doesn’t give us a free pass when it comes to physical delivery. We should still practice for physical delivery that enhances our verbal message. Physical delivery of a speech involves nonverbal communication through the face and eyes, gestures, and body movements. We tend to look at a person’s face when we are listening to them. Again, this often makes people feel uncomfortable and contributes to their overall speaking anxiety. Many speakers don’t like the feeling of having “all eyes” on them, even though having a room full of people avoiding making eye contact with you would be much more awkward. Remember, it’s a good thing for audience members to look at you, because it means they’re paying attention and interested. Audiences look toward the face of the speaker for cues about the tone and content of the speech. Facial expressionsMovements of the face that help convey emotions and demonstrate enthusiasm during a speech. can help bring a speech to life when used by a speaker to communicate emotions and demonstrate enthusiasm for the speech. As with vocal variety, we tend to use facial expressions naturally and without conscious effort when engaging in day-to-day conversations. Yet I see many speakers’ expressive faces turn “deadpan” when they stand in front of an audience. Some people naturally have more expressive faces than others—think about the actor Jim Carey’s ability to contort his face as an example. But we can also consciously control and improve on our facial expressions to be more effective speakers. As with other components of speech delivery, becoming a higher self-monitor and increasing your awareness of your typical delivery habits can help you understand, control, and improve your delivery. Although you shouldn’t only practice your speech in front of a mirror, doing so can help you get an idea of how expressive or unexpressive your face is while delivering your speech. There is some more specific advice about assessing and improving your use of facial expressions in the “Getting Competent” box in this chapter. Facial expressions are key for conveying emotions and enthusiasm in a speech. Facial expressions help set the emotional tone for a speech, and it is important that your facial expressions stay consistent with your message. In order to set a positive tone before you start speaking, briefly look at the audience and smile. A smile is a simple but powerful facial expression that can communicate friendliness, openness, and confidence. Facial expressions communicate a range of emotions and are also associated with various moods or personality traits. For example, combinations of facial expressions can communicate that a speaker is tired, excited, angry, confused, frustrated, sad, confident, smug, shy, or bored, among other things. Even if you aren’t bored, for example, a slack face with little animation may lead an audience to think that you are bored with your own speech, which isn’t likely to motivate them to be interested. So make sure your facial expressions are communicating an emotion, mood, or personality trait that you think your audience will view favorably. Also make sure your facial expressions match with the content of your speech. When delivering something lighthearted or humorous, a smile, bright eyes, and slightly raised eyebrows will nonverbally enhance your verbal message. When delivering something serious or somber, a furrowed brow, a tighter mouth, and even a slight head nod can enhance that message. If your facial expressions and speech content are not consistent, your audience could become confused by the conflicting messages, which could lead them to question your honesty and credibility. Did anything surprise you? Were you as expressive as you thought you were? What facial expressions did you use throughout the speech? Where did your facial expressions match with the content of your speech? Where did your facial expressions not match with the content of your speech? Where could you include more facial expressions to enhance your content and/or delivery? You can also have a friend watch the video and give you feedback on your facial expressions to see if your assessment matches with theirs. Once you’ve assessed your video, re-record your speech and try to improve your facial expressions and delivery. Revisit the previous questions to see if you improved. Eye contact is an important element of nonverbal communication in all communication settings. Chapter 4 "Nonverbal Communication" explains the power of eye contact to make people feel welcome/unwelcome, comfortable/uncomfortable, listened to / ignored, and so on. As a speaker, eye contactElement of nonverbal delivery that helps establish credibility and hold an audience’s attention. can also be used to establish credibility and hold your audience’s attention. We often interpret a lack of eye contact to mean that someone is not credible or not competent, and as a public speaker, you don’t want your audience thinking either of those things. Eye contact holds attention because an audience member who knows the speaker is making regular eye contact will want to reciprocate that eye contact to show that they are paying attention. This will also help your audience remember the content of your speech better, because acting like we’re paying attention actually leads us to pay attention and better retain information. Eye contact is an aspect of delivery that beginning speakers can attend to and make noticeable progress on early in their speech training. By the final speech in my classes, I suggest that my students make eye contact with their audience for at least 75 percent of their speech. Most speakers cannot do this when they first begin practicing with extemporaneous delivery, but continued practice and effort make this an achievable goal for most. As was mentioned in Chapter 4 "Nonverbal Communication", norms for eye contact vary among cultures. Therefore it may be difficult for speakers from countries that have higher power distances or are more collectivistic to get used to the idea of making direct and sustained eye contact during a speech. In these cases, it is important for the speaker to challenge himself or herself to integrate some of the host culture’s expectations and for the audience to be accommodating and understanding of the cultural differences. Once in front of the audience, establish eye contact before you speak. Make slow and deliberate eye contact, sweeping through the whole audience from left to right. 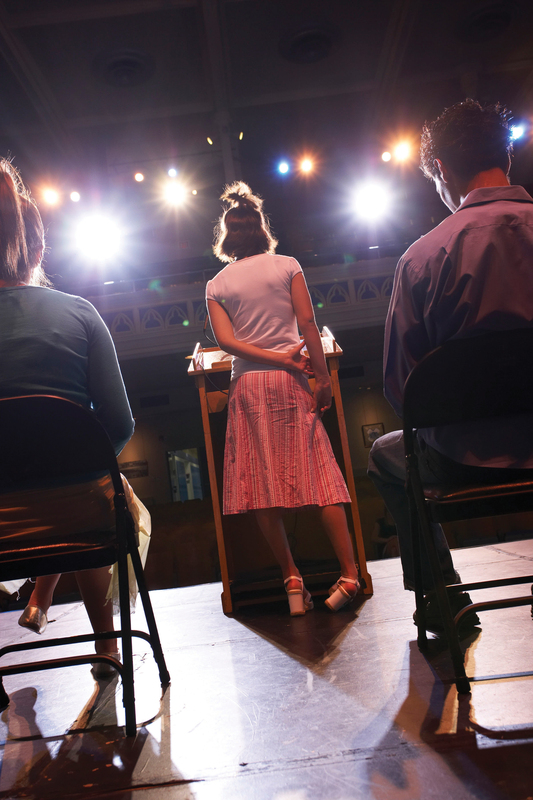 Despite what high school speech teachers or others might have told you, do not look over the audience’s heads, at the back wall, or the clock. Unless you are in a huge auditorium, it will just look to the audience like you are looking over their heads. Do not just make eye contact with one or a few people that you know or that look friendly. Also, do not just make eye contact with your instructor or boss. Even if it’s comforting for you as the speaker, it is usually awkward for the audience member. Try to memorize your opening and closing lines so you can make full eye contact with the audience. This will strengthen the opening and closing of your speech and help you make a connection with the audience. Have you ever gotten dizzy as an audience member because the speaker paced back and forth? I know I have. Anxiety can lead us to do some strange things with our bodies, like pacing, that we don’t normally do, so it’s important to consider the important role that your body plays during your speech. Extra movements caused by anxiety are called nonverbal adaptorsBody movements triggered by anxiety that often occur unconsciously but are distracting for the audience., and most of them manifest as distracting movements or gestures. These nonverbal adaptors, like tapping a foot, wringing hands, playing with a paper clip, twirling hair, jingling change in a pocket, scratching, and many more, can definitely detract from a speaker’s message and credibility. Conversely, a confident posture and purposeful gestures and movement can enhance both. PosturePosition we assume with our body, either intentionally or out of habit. is the position we assume with our bodies, either intentionally or out of habit. Although people, especially young women, used to be trained in posture, often by having them walk around with books stacked on their heads, you should use a posture that is appropriate for the occasion while still positioning yourself in a way that feels natural. In a formal speaking situation, it’s important to have an erect posture that communicates professionalism and credibility. However, a military posture of standing at attention may feel and look unnatural in a typical school or business speech. In informal settings, it may be appropriate to lean on a table or lectern, or even sit among your audience members. Head position is also part of posture. In most speaking situations, it is best to keep your head up, facing your audience. A droopy head doesn’t communicate confidence. Consider the occasion important, as an inappropriate posture can hurt your credibility. Government and military leaders use an erect posture to communicate confidence and professionalism during public appearances. 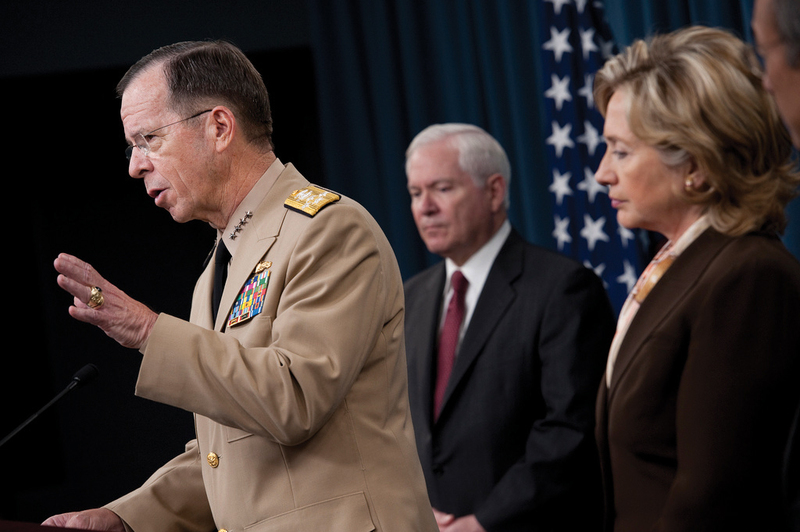 Source: Photo courtesy of U.S. Department of Defense, http://commons.wikimedia.org/wiki/File:Defense.gov_News_Photo_100406-N-0696M-096.jpg. GesturesArm and hand movements used during a speech. include arm and hand movements. We all go through a process of internalizing our native culture from childhood. An obvious part of this process is becoming fluent in a language. Perhaps less obvious is the fact that we also become fluent in nonverbal communication, gestures in particular. We all use hand gestures while we speak, but we didn’t ever take a class in matching verbal communication with the appropriate gestures; we just internalized these norms over time based on observation and put them into practice. By this point in your life, you have a whole vocabulary of hand movements and gestures that spontaneously come out while you’re speaking. Some of these gestures are emphatic and some are descriptive.Arthur Koch, Speaking with a Purpose, 7th ed. (Boston, MA: Pearson, 2007), 105. Emphatic gestures are the most common hand gestures we use, and they function to emphasize our verbal communication and often relate to the emotions we verbally communicate. Pointing with one finger or all the fingers straight out is an emphatic gesture. We can even bounce that gesture up and down to provide more emphasis. Moving the hand in a circular motion in front of our chest with the fingers spread apart is a common emphatic gesture that shows excitement and often accompanies an increased rate of verbal speaking. We make this gesture more emphatic by using both hands. Descriptive gestures function to illustrate or refer to objects rather than emotions. We use descriptive gestures to indicate the number of something by counting with our fingers or the size, shape, or speed of something. Our hands and arms are often the most reliable and easy-to-use visual aids a speaker can have. While it can be beneficial to plan a key gesture or two in advance, it is generally best to gesture spontaneously in a speech, just as you would during a regular conversation. For some reason, students are insecure about or uncomfortable with gesturing during a speech. Even after watching their speech videos, many students say they think they “gestured too much” or nit-pick over a particular gesture. Out of thousands of speeches I’ve seen, I can’t recall a student who gestured too much to the point that it was distracting. Don’t try to overdo your gestures though. You don’t want to look like one of those crazy-arm inflatable dancing men that companies set up on the side of the road to attract customers. But more important, don’t try to hold back. Even holding back a little usually ends up nearly eliminating gestures. While the best beginning strategy is to gesture naturally, you also want to remain a high self-monitor and take note of your typical patterns of gesturing. If you notice that you naturally gravitate toward one particular gesture, make an effort to vary your gestures more. You also want your gestures to be purposeful, not limp or lifeless. I caution my students against having what I call “spaghetti noodle arms,” where they raise their hand to gesture and then let it flop back down to their side. Sometimes movement of the whole body, instead of just gesturing with hands, is appropriate in a speech. I recommend that beginning speakers hold off trying to incorporate body movement from the waist down until they’ve gotten at least one speech done. This allows you to concentrate on managing anxiety and focus on more important aspects of delivery like vocal variety, avoiding fluency hiccups and verbal fillers, and improving eye contact. When students are given the freedom to move around, it often ends up becoming floating or pacing, which are both movements that comfort a speaker by expending nervous energy but only serve to distract the audience. Floating refers to speakers who wander aimlessly around, and pacing refers to speakers who walk back and forth in the same path. To prevent floating or pacing, make sure that your movements are purposeful. Many speakers employ the triangle method of body movement where they start in the middle, take a couple steps forward and to the right, then take a couple steps to the left, then return back to the center. Obviously you don’t need to do this multiple times in a five- to ten-minute speech, as doing so, just like floating or pacing, tends to make an audience dizzy. To make your movements appear more natural, time them to coincide with a key point you want to emphasize or a transition between key points. Minimize other movements from the waist down when you are not purposefully moving for emphasis. Speakers sometimes tap or shuffle their feet, rock, or shift their weight back and forth from one leg to the other. Keeping both feet flat on the floor, and still, will help avoid these distracting movements. Audience members primarily take in information through visual and auditory channels. Just as the information you present verbally in your speech can add to or subtract from your credibility, nonverbal communication that accompanies your verbal messages affects your credibility. Looking like a credible and prepared public speaker will make you feel more like one and will make your audience more likely to perceive you as such. This applies to all speaking contexts: academic, professional, and personal. Although the standards for appropriate personal appearance vary between contexts, meeting them is key. You may have experienced a time when your vocal and physical delivery suffered because you were not “dressed the part.” The first time I ever presented at a conference, I had a terrible cold and in my hazy packing forgot to bring a belt. While presenting later that day, all I could think about was how everyone was probably noticing that, despite my nice dress shirt tucked into my slacks, I didn’t have a belt on. Dressing the part makes you feel more confident, which will come through in your delivery. Ideally, you should also be comfortable in the clothes you’re wearing. If the clothes are dressy, professional, and nice but ill fitting, then the effect isn’t the same. Avoid clothes that are too tight or too loose. Looking the part is just as important as dressing the part, so make sure you are cleaned and groomed in a way that’s appropriate for the occasion. The “Getting Real” box in this chapter goes into more detail about professional dress in a variety of contexts. Things to generally avoid. Jeans, hats, flip-flops, exposed underwear, exposed stomachs, athletic wear, heavy cologne/perfume, and chewing gum. General dress guidelines for men. Dress pants or khaki pants, button-up shirt or collared polo/golf shirt tucked in with belt, and dress shoes; jacket and/or tie are optional. General dress guidelines for women. Dress pants or skirt, blouse or dress shirt, dress, and closed-toe dress shoes; jacket is optional. Finishing touches. Make sure shoes are neat and polished, not scuffed or dirty; clothes should be pressed, not wrinkled; make sure fingernails are clean and trimmed/groomed; and remove any lint, dog hair, and so on from clothing. Obviously, these are general guidelines and there may be exceptions. It’s always a good idea to see if your place of business has a dress code, or at least guidelines. If you are uncertain whether or not something is appropriate, most people recommend to air on the side of caution and choose something else. While consultants and professionals usually recommend sticking to dark colors such as black, navy, and charcoal and/or light colors such as white, khaki, and tan, it is OK to add something that expresses your identity and makes you stand out, like a splash of color or a nice accessory like a watch, eyeglasses, or a briefcase. In fact, in the current competitive job market, employers want to see that you are serious about the position, can fit in with the culture of the organization, and are confident in who you are.Amy Verner, “Interview? Ditch the Navy Suit,” The Globe and Mail, December 15, 2008, L1. What do you think is the best practice to follow when dressing for a job interview? In what professional presentations would you want to dress formally? Business casual? Casual? Aside from the examples listed previously, what are some other things to generally avoid, in terms of dress and appearance, when trying to present yourself as a credible and competent communicator/speaker? In what ways do you think you can conform to business-casual expectations while still preserving your individuality? Visual aids play an important role in conveying supporting material to your audience. They also tie to delivery, since using visual aids during a speech usually requires some physical movements. It is important not to let your use of visual aids detract from your credibility. I’ve seen many good speeches derailed by posters that fall over, videos with no sound, and uncooperative PowerPoint presentations. Only have your visual aid displayed when it is relevant to what you are saying: insert black slides in PowerPoint, hide a model or object in a box, flip a poster board around, and so on. Make sure to practice with your visual aids so there aren’t any surprises on speech day. Don’t read from your visual aids. Put key information from your PowerPoint or Prezi on your speaking outline and only briefly glance at the screen to make sure you are on the right slide. You can also write information on the back of a poster or picture that you’re going to display so you can reference it while holding the visual aid up, since it’s difficult to hold a poster or picture and note cards at the same time. Triple check your technology to make sure it’s working: electricity, Internet connection, wireless clicker, sound, and so on. Proofread all your visual aids to find spelling/grammar errors and typos. Bring all the materials you may need to make your visual aid work: tape/tacks for posters and pictures, computer cables/adaptors, and so on. Don’t assume these materials will be provided. Have a backup plan in case your visual aid doesn’t work properly. Facial expressions help communicate emotions and enthusiasm while speaking. Make sure that facial expressions are consistent with the content being presented. Record yourself practicing your speech in order to evaluate your use of facial expressions. Eye contact helps establish credibility and keep your audience’s attention while you’re speaking. Posture should be comfortable and appropriate for the speaking occasion. Emphatic and descriptive gestures enhance the verbal content of our speech. Gestures should appear spontaneous but be purposeful. Movements from the waist down should be purposefully used to emphasize a point or as a transition during a speech. Audience members will make assumptions about your competence and credibility based on dress and personal appearance. Make sure your outer presentation of self is appropriate for the occasion and for the impression you are trying to project. Visual aids can add to your speech but can also interfere with your delivery and negatively affect your credibility if not used effectively. Identify three goals related to delivery that you would like to accomplish in this course. What strategies/tips can you use to help achieve these goals? What nonverbal adaptors have you noticed that others use while speaking? Are you aware of any nonverbal adaptors that you have used? If so, what are they? Getting integrated: Identify some steps that speakers can take to ensure that their dress and physical appearance enhance their credibility. How might expectations for dress and physical appearance vary from context to context (academic, professional, personal, and civic)?